I just have one more run until Boston! Andrew and I are going to run 3 miles on Saturday and then I’ll take Sunday off followed by 26.2-26.8 (I’m awful at tangents at big races ha) miles on Monday! It was cold outside and I almost jumped on the treadmill but then remembered I’ll be on the treadmill a lot more coming up when Andrew starts working and that got me out the door! 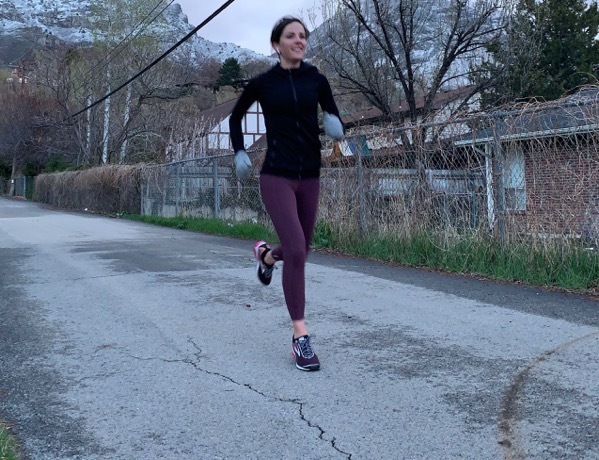 I am not racing on Monday but I did want to do a few little one minute pick-ups (pick-ups = what my marathon pace used to be;) just to get the blood flowing yesterday. 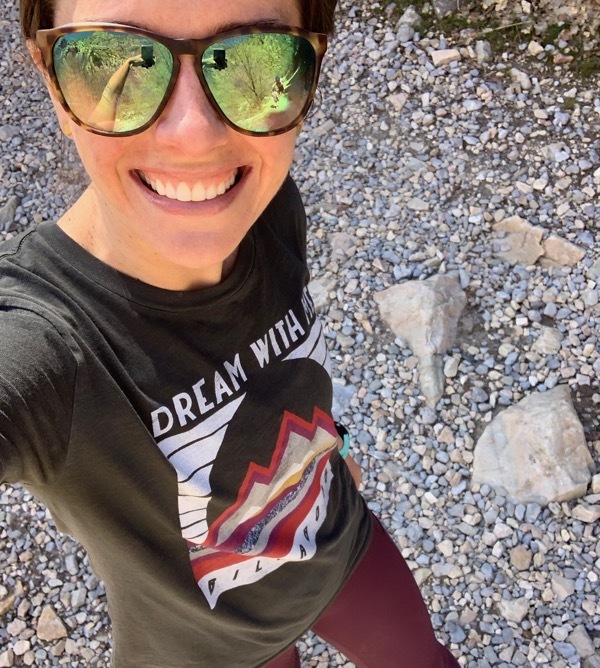 PS the leggings I told you about last week that are very similar to my Lulu ones (but only $28) are the best to run in… they do not move the entire run. Our day was spent getting everything ready to leave today and lot’s of playing. 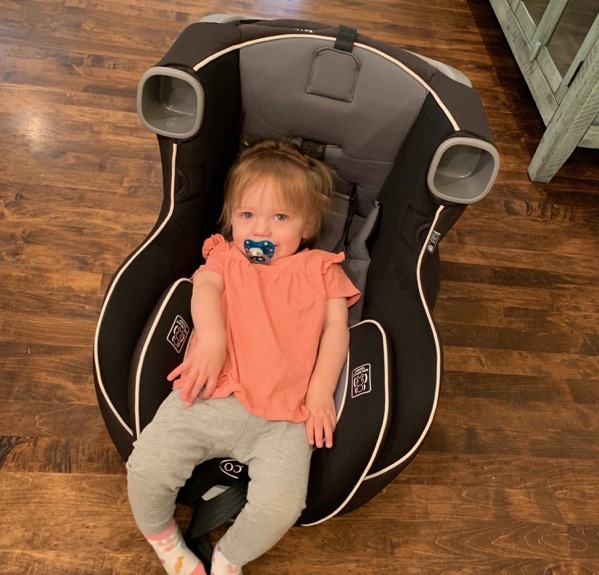 Skye was thrilled to have a clean carseat… I may have found food caught underneath the fabric from way too long ago. Brooke has cross-country which was a blast! Here is what I have packed and ready for Monday (not in picture—> dove deodorant for chafing and vaseline + chargers)! 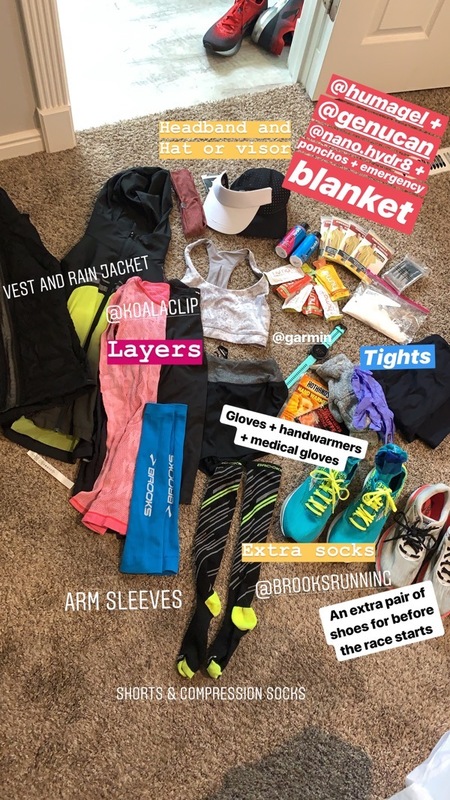 I am overpacking more than ever for this race but I just want to make sure I’m ready for whatever the weather has in store for us. 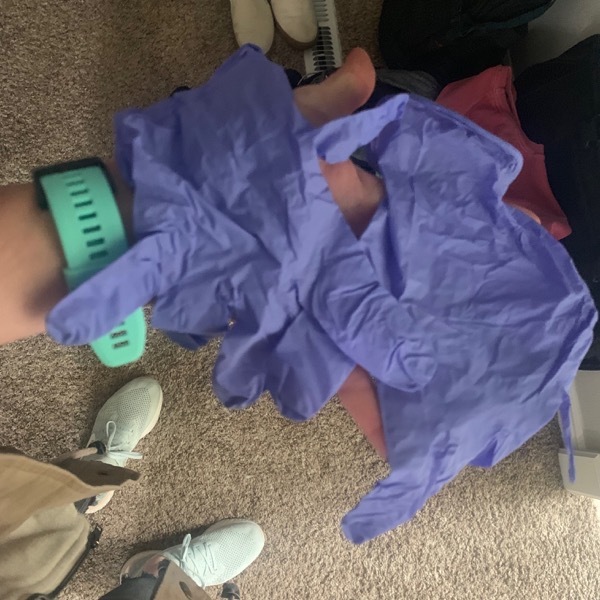 PS thank you so much for those that shared bringing medical gloves to go over your gloves for running in the rain… I’ve never thought of this before. My hands are going to stay so warm and toasty. Also, thanks for sharing to bring an extra pair of shoes and socks to wear until the race starts so I don’t start the race with wet/muddy shoes/socks. *This episode from Oprah is LIFE-CHANGING. Wow. I will be re-listening to it over and over again. *A t-shirt I’ve been wearing quite frequently (I’m sure you’ve noticed;) from Andrew. The mountains on it make me happy. *Two new Costco favorites…. We saw these in the snack aisle and they are amazing. I should have just used these for my ultra and all of the training instead of the HoneyStinger ones that they sell individually for almost $2! These were $9 for 40 of them! 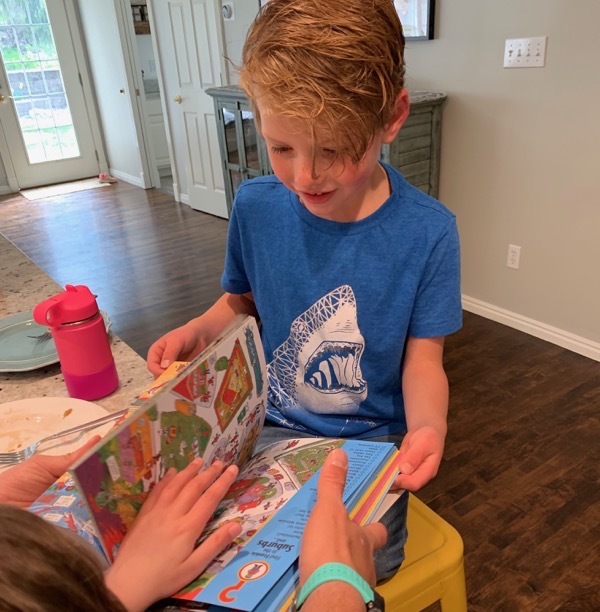 *In the books for kids section at Costco they have a huge book full of search and find. These are Knox’s favorite. He sat still for at least an hour looking at these the other day! *I love Gushers a lot. It’s weird how much I love them. 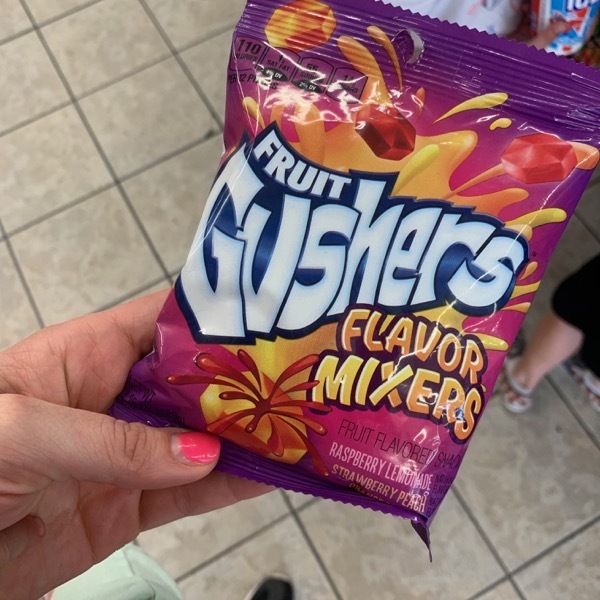 The other day we were getting the kids slurpees after cross country and Brooke saw these in the gas station (she knows my love for Gushers) and we immediately bought them. There were so many in there ha. *My favorite room spray on the planet… Another need over here with a dog and three little kids haha. I love hearing the amazing things you are doing so send them to [email protected] if you would like to be featured!!! Are there any type of fruit snacks or foods/treats that are made for kids that you absolutely love? Where was the last place that you flew to? I’m a huge Gushers girl, too! They’re just so darn great!! I’m going bridesmaid dress shopping with one of my best friends (this will be my 20th wedding to be in—yikes!) this weekend and am so looking forward to resting and hanging out with my family. Dark chocolate Dove Promises are my favorite, lately, with either almonds or peanut butter filling. I have both a dinner and a game night with girlfriends this weekend! And 77 degrees. Aaaahhhh! 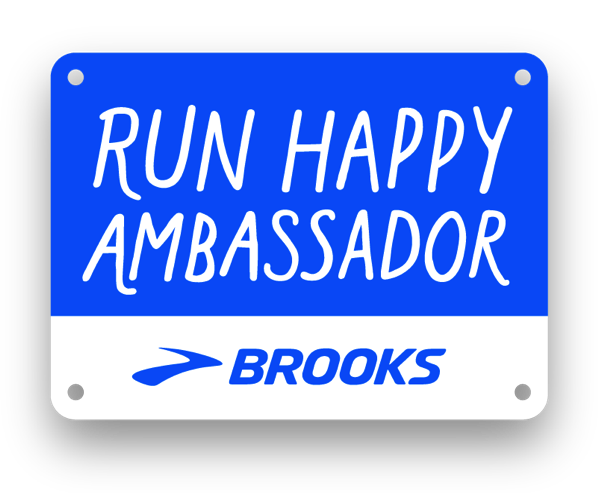 Have the most fun eating and running your way through Boston! Yes to gushers. All the gushers! I last flew to San Diego and back. I don’t fly often, it TERRIFIES me. I spend the whole travel day a nervous wreck. My Friday favorites are my new Senita bra with the built in phone pocket (even easier to access than koala clip!). It is a super cool black and white stripe print with big red flowers, too, so it looks super summery. I plan to buy one in every color option! I’m also loving my Hawaiian Tropic sunscreen…………..it’s time to bust it out on my runs again, and it smells soooooo good. They make a 50 spf sport and it’s the only one that works for my long summer runs in the south! This weekend my sister in law is in town and we have a 3 day film festival we are attending! Lot of fun, movies, coffee, and probably very little sleep, ha! Have a great trip, I will be cheering for you Monday!! Last time I flew was during Christmas travels, so it’s been a while. But in two weeks I’m flying to Chicago, so excited! Good luck/Have fun in Boston!! I haven’t flown in almost a decade. We are a road trip kind of family. Yesterday I found these Easter bunnies that taste like circus peanuts, which I love, but I’m pretty sure most people think are disgusting. Try to bring a pool float for athlete’s village! it’s easy to sit on (better than a trash bag) and should have more area to sit on. think an inner tube or something like that! good luck this weekend!!! Try to bring a pool float to sit on in athletes village. Think like a inner tube or something of the sort. It’s much easier to sit on than a trash bag and you don’t need to fill it up. Good luck this weekend!! Good luck this weekend Janae. I know if I was running, I would pack just as many things. I’m doing a half down the shore and the weather will be the same. I’ll probably pack like I’m going on a week vacation, despite being gone a night. Lol. I love the pink and white animal cookies with the sprinkles :) They are sometimes hard to find at the store now! This weekend I’m excited to travel to Boston and hopefully meet you!! I’m so excited to hear about your Boston race! This weekend I’m looking forward to getting in some time outside and maybe cleaning out my car, ha! Also, that stain cleaner and room spray sound amazing. 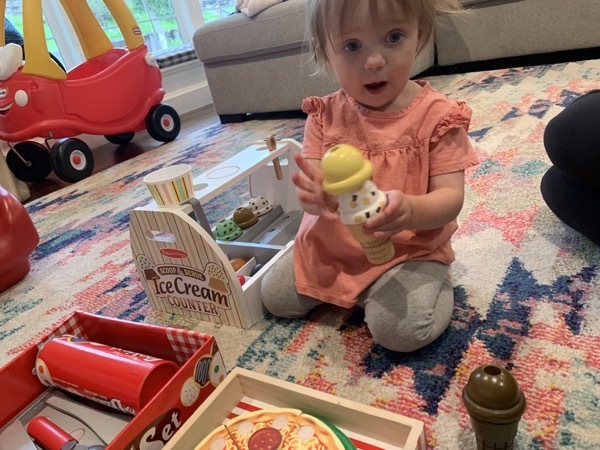 I LOVE Scooby snacks a little too much these days; let’s just say my daughter and I have our own boxes and mine is always gone first! Good luck on Monday! Sour Patch kids/straws! I don’t eat them often, but my favorites are the straws. Have a great time in Boston!!! I’ll be cheering you on from my desk Monday! Is it weird I bought those Gushers at a gas station the other day and thought of you?? PS i live in Boston and hope to meet you on Sunday! My friend is volunteering in the tent before the race. She’s done it for years and said they always have hot chocolate to hand out to keep everyone warm on the cold days! I LOVE veggie straws and animal crackers. Seriously love them. It is supposed to rain for my race Sunday and I am definitely using the latex glove tip. 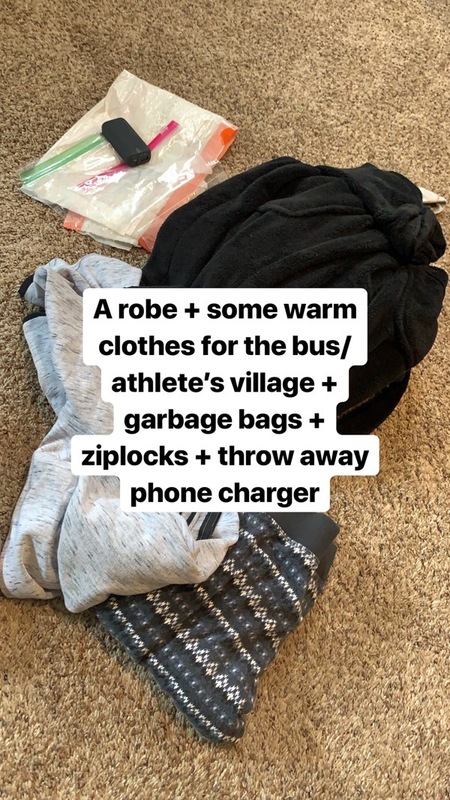 I also bring Target plastic bags and tie them on my foot over my sock before I put my shoe on when I have to run in the rain. It’s not cute haha but it does keep my foot comfortable and they’re so thin they don’t bother me at all. Have a great weekend and run!! 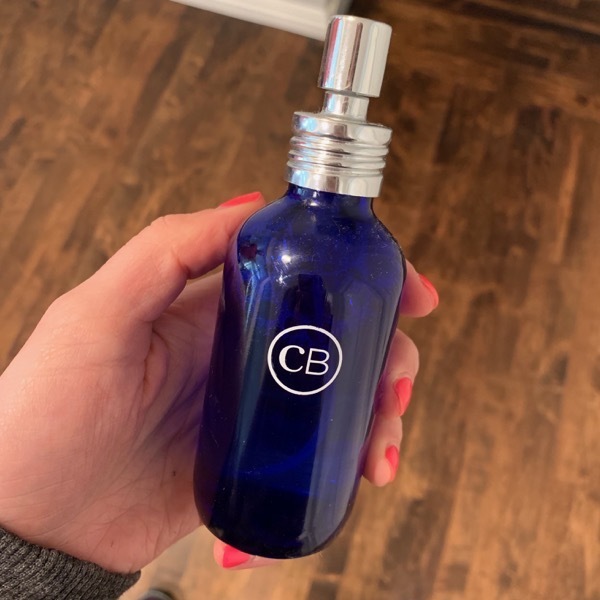 I had no idea there was a Capri Blue room spray! I’m going to get some today!! Have a FANTASTIC time in Beantown!! I worked at the marathon for two years, providing medical care along the course (I was assigned to the area just past Wellesley), but not this year. All of the spirit and grit runners show on the course is truly inspiring!! Fave Snack: ALL. THE. GOLDFISH. Friday Favorite: Frozen Girl Scout Thin Mints!! Looking Forward to: A FREE weekend with no scheduled commitments except Sunday brunch with friends. It’s been many months since we’ve had one of those in our house. What gas station did you fins those gushers at??? Pretty sure that would make my husband happier than a kid on Christmas day in Disneyland!! Hey you!!! Wills pit stop! Go today! 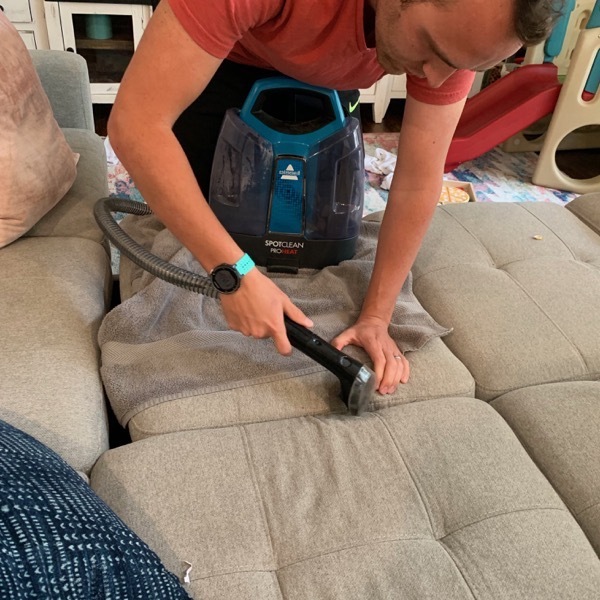 I need that spot cleaner! I instantly added it to my cart! And that award! What a beauty! I think the last place I flew to was Hawaii for my honeymoon … over 10 years ago! Before then I was going to Boston every year to see family. Since my wedding and having kids, they’ve been coming here. I need to change that ASAP! Two of my Friday favorites are my new trucker hate I recently purchased from a local artist (whiskeyjackdesigns.com). She does watercolor paintings on wood, bike fenders, trucker hats etc and paints (mostly) local landscapes. I bought a sunrise Mount Rainier trucker that fits like a glove. Another fav is I ran 6 miles this morning with NO ankle pain and NO walking breaks! This weekend soccer starts and I also hope to get on the trails! I’m also looking forward to Marathon Monday as I’ll be watching from the comforts of my cubicle at work! Ha! I love Peeps! I rarely eat them now, though, because they give me a sugar crash. But they’re amazing. I LOVE animal crackers, goldfish, etc etc. I recently found a 5lb container of animal crackers on amazon and am embarrassed by how fast it is going, haha. Last time I flew was a work trip to New Orleans this past fall. I hadn’t flown since I was a kid and was super nervous. Then we had terrible turbulence…I was SO GLAD when we landed! Hmmmm Friday favorites….Vegan Rob’s Cauliflower or Brussel Sprout Puffs. Sounds gross but they are very good and a healthier/plant based version of cheese doodles! I am super excited to run my first half of the season tomorrow! Our local running club is putting it on and it’s the inaugural race. 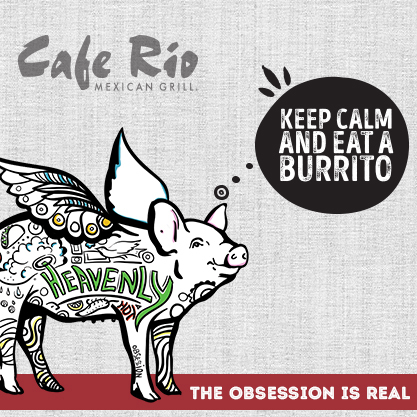 They have pulled out all the stops and it looks like it’s going to be an awesome race, plus a full meal at the end! I am also running with with my boyfriend and a few other friends so it’s just going to be one big party, I can’t wait! Wishing you the absolute best of luck in Boston! You’re incredible, running this so soon after your ultra! Can’t wait to hear/read all about it! I can’t wait to follow the marathon! Good luck and have fun! I love the fruit and veggie sauce packs! They are great to pack while traveling. I am flying to NYC tonight for our spring break! I’ve never been, and I am super excited! Do you remember sodalicious fruit snacks? They were basically little soda pops that came in coke/cream soda flavour and I think grape? Well I grew up with those as a kid and they were my favourite! I don’t think they sell them anymore but gushers were also a kid fav. Now I eat my 1 year olds arrowroot cookies ha! Have fun in Boston! Cannot wait to follow it on Monday! I loved Gushers as a kid, but have not had them in awhile. I just flew to Charleston, SC last week for the Cooper River Bridge 10k. There are so many people who run it! Such a great time and so much fun checking out the city! I just ordered the Koala Clip, cannot wait to try it out! Thanks for all of your recommendations both for fueling and gear. So far I have really LOVED the UCan energy and the hydrate is great as well! Huma gel is also awesome and now I want to try the nanohydrate as well! Oh my goodness! 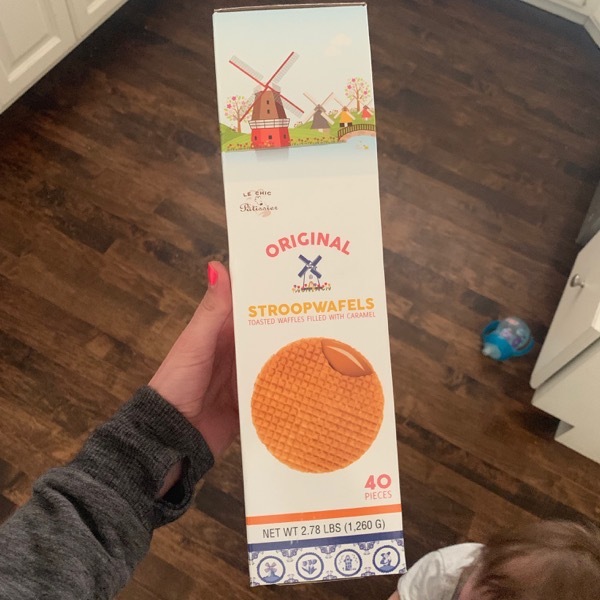 Thank you for the tip on the Stroopwaffles at Costco! I want to use those for my Half Ironman this summer but try to avoid individually wrapped treats so buying in bulk is perfect. Also thinking gushers are a must for my half because they were definitely a childhood favorite. This weekend I’m looking forward to an 8 mile run (its so weird to me that I actually now look forward to this and have made some really good speed improvement in the last couple of weeks- which is weird for me), mountain biking and then a 3 hour road bike! Have a fantastic trip to Boston! If you get a chance, I recommend checking out the Taza chocolate factory in Somerville. Lots of chocolate samples and you get to learn about the traditional way of making chocolate from Mexico! I’m leaving today for Boston and I have so much stuff packed! I am clueless what I am gonna wear so I brought everything! Wish I could go to your meet up but won’t arrive in Boston til a little later that day! Have a great race and hope I run into you! Hi Janae! I’m so excited for you! Reading your blog has inspired me to start running and train for my first ever half marathon. 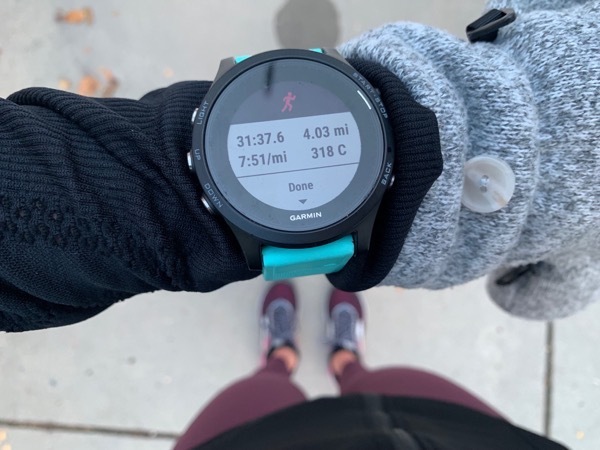 Can you share with me which Garmin you use now? I looked at your products page but it looks like the one you have linked is an older model and I was wondering if you’re still using it or if your changed to a newer model. All the best to you in Monday and always. You inspire me more than you know!!! Hey!!! Thank you so so much! I use and love the Garmin 935 now! I need to update my gear page! Keep me updated with your training, so excited for you! Stroopwafels are fantastic! Here in the Netherlands we sometimes buy them freshly made at a market stall. They only sell really big ones. 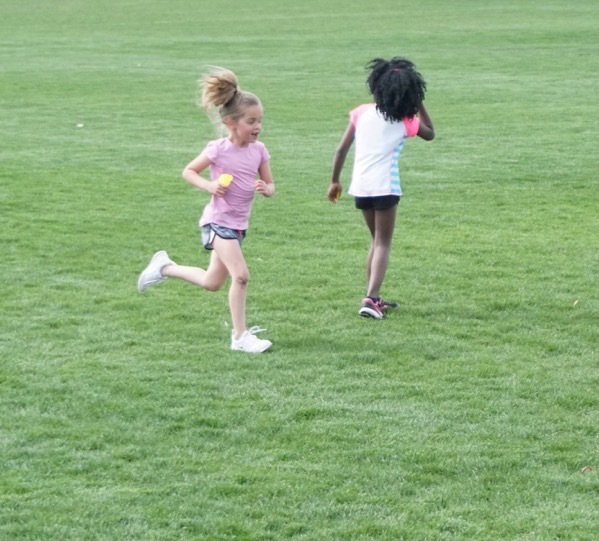 Enjoy your race in Boston Janae! Cheez its and chicken nuggets are 2 of my favorite foods! Brooke looks like a natural at cross country! Volcano room spray is amazing! Also highly recommend the reed diffusers in that scent! Those waffle cookies are the best! If you make a mug of hot cocoa place one on top and it’ll get all warm and perfect! Good luck running Boston, hoping for good weather for all the runners! …I am reading your blog, after I googled logs to read, haha. Yours was in the top ten. I added about 40 to my blogs, some physical, and some spiritual. I’m a Christian. I look forward to it each day. You know the ones I actually read. I am trying to make a comeback after being lazy far too long. I need all the inspiration I can get, haha. My wife and I have been going through some things (her health included), and I’ve just not been bitten by the running BUG, lol. 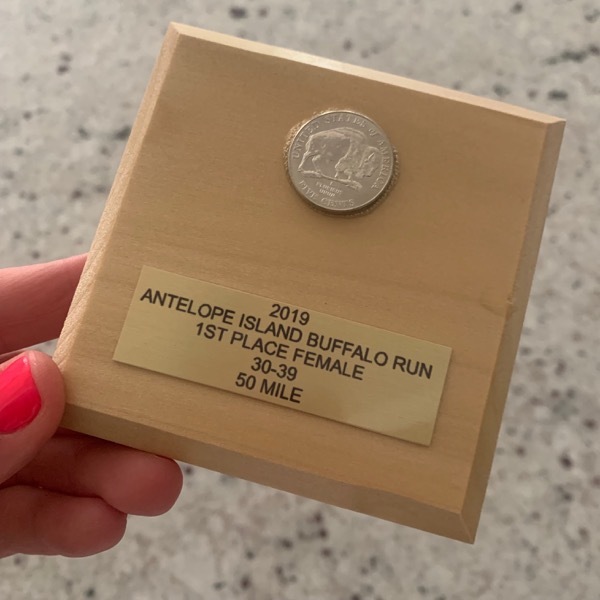 I liked 50 miler, which is something I’ve never done. You did a fantastic job. The overall time was awesome. I loved the post that gave all the race details. I’m sure it’s a beast of a run, or (at least) I would think so. Again, fine job. Good luck with your Boston Marathon. I thought the qualifying time was very impressive. I ran two when I was a lot younger. 1999 in 3:36.51, and 2000 in 3:26.25. I”ve been there before but I’m older at 56 compared to my 30s when I was so serious. Today I feel like Old Man Running, haha. I am still not giving up, and will try to get started back on Monday, (more serious) than ever before. God is good all the time, and God is my strength 2/run. I only have one son. His name is Andrew, cool name. God Bless You and yours. I hope it’s ok to comment. We are all God”s people, and runners are runners. 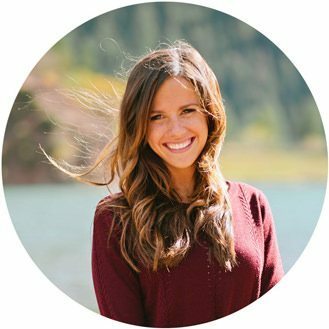 I hope you have a chance to meet Katherine Switzer …I did last September after the 5th that I PR’D in. She was so encouraging , supporting & friendly . Hugs, Kisses, Run Safe Wishes at Boston ! I just have to tell you to warm your stroopwaffels up a bit and it brings them to the next level! 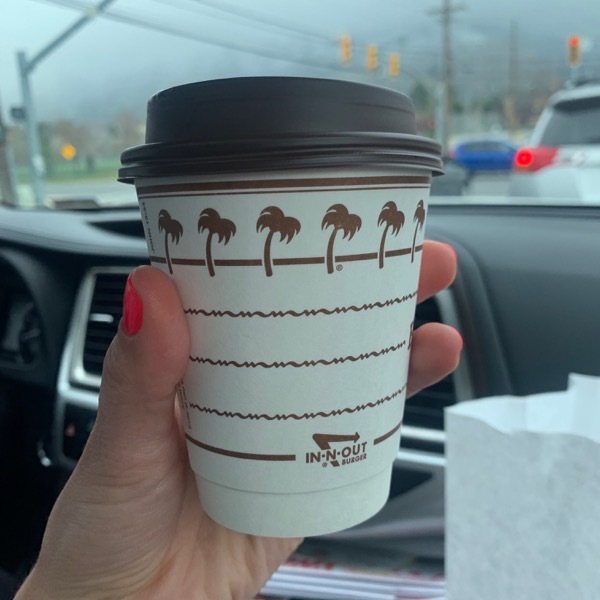 I put mine over my cup of coffee for a couple minutes (hot chocolate would work too)- so good!